Paul Barden Roses: 155-10-01: Roxburghii, are you in there?? For years there has been much discussion about the pedigree of a number of roses that list the species R. roxburghii as a parent. The Tantau Floribunda 'Floradora' (1944, Germany), for example, lists 'Baby Château' as the seed parent and R. roxburghii as the pollen parent. Now, at a glance, there isn't the slightest hint of the species parent in the look of 'Floradora', which has led many to doubt its listed parentage. I myself doubted Tantau's pedigree for the longest time, at least unbtil I had some experience in using certain species and near-species hybrids in breeding, especially when they were employed as pollen parents. Let me elaborate. I frequently use certain seed parents in making crosses that might be impossible on many other parents. After a while, you start to recognize which of your seed parents are likely to be "door openers" when planning iffy crosses. Introducing certain species can be especially difficult; sometimes the chromosome counts don't match, or the two varieties are simply too distant from one another in the family. I believe there are other unknown factors that play a role in fertility. Whatever the case, I found that even when using very willing seed parents, certain pollens would result in seed that, once germinated, turned out to be the result of apomixis*. Apomixis is what happens when pollen initiates the fertilization response in a plant, but once the pollen tubes grow into the ovary, the genes prove unusable. So, in an effort to salvage the seed making process, the plant instead duplicates its own genes, in effect cloning itself. 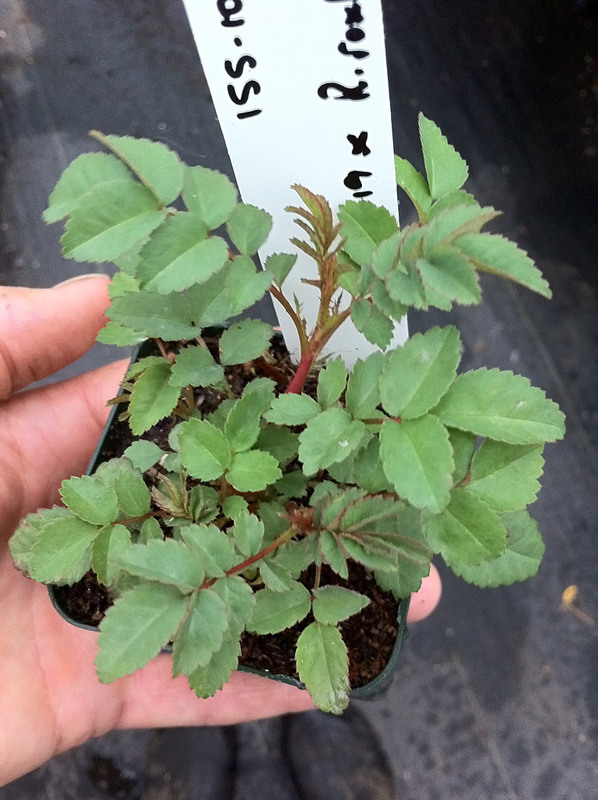 In roses, I suspect there is some recombinant action occurring as well, since some of the individuals arising from such crosses are not identical to the parent plant, but appear to be highly similar. In some cases undoubtedly some selfing may also occur, perhaps the result of insect activity, or simply incomplete emasculation. Until this individual reached a certain size I was unwilling to make many assumptions about its pedigree. But now, I look at it and I come to the conclusion that this is actually, for real, a R. roxburghii hybrid. Look closely: the most recent leaves are now composed of nine leaflets, surely a sign that roxburghii is influencing its development. I don't expect to see flowers this year, which is fine. Right now I am just fascinated to see its vegetative development. I doubt this is any kind of proof of the presence of R. roxburghii in its ancestor, 'Floradora', but it does show that when using the species, the resulting seedlings can show clear evidence of roxburghii traits. Fascinating. *For more on apomixis, see the Wikipedia article here. Very inspirational, good luck with it Paul.